Shredded pansies are the work of nocturnal feeding by slugs. As wet weather continues in the Baltimore - Washington area, moist gardens have been visited by droves of plant-eating slugs. These non-insect herbivores are mollusks, members of a large clan of creatures including aquatic species such as clams, octopi, and nudibranchs. Terrestrial mollusks like snails and slugs eat a wide variety of organic matter including vegetables and ornamental plants. On the up-side, slugs are important recyclers of organic matter. On the down-side, slugs are serious crop pests in my garden and worldwide. During my slug musings, I often wondered where slugs hang out on bright sunny days. Clearly, they were nowhere to be found at their feeding stations. Near my front flowerbed there is a large crack where the sidewalk has slipped an inch or two and separated from the doorstep. One sultry spring evening as dusk arrived, I was astonished to see dozens of large and small slugs emerge from beneath my front stoop and glide across the sidewalk into the flower bed where my pansies were fast disappearing. At first light the next morning, the migration reversed, and a stream of slugs flowed back beneath my front stoop. As invertebrates go, slugs sit pretty high up on sensory function and IQ scales. At the front end of the beast, two pairs of tentacles waggle about in seemingly uncoordinated gesticulations. The pair nearer the ground is used to detect odors such as the smell of tasty plants and the scent trail that leads slugs back to their hideout beneath my doorstep each morning. Waving in the air is a second pair of tentacles capable of sensing light, the eyes of a slug as they were. Unlike many of their less intellectual kin, slugs are able to learn and remember certain odors and flavors associated with their food. 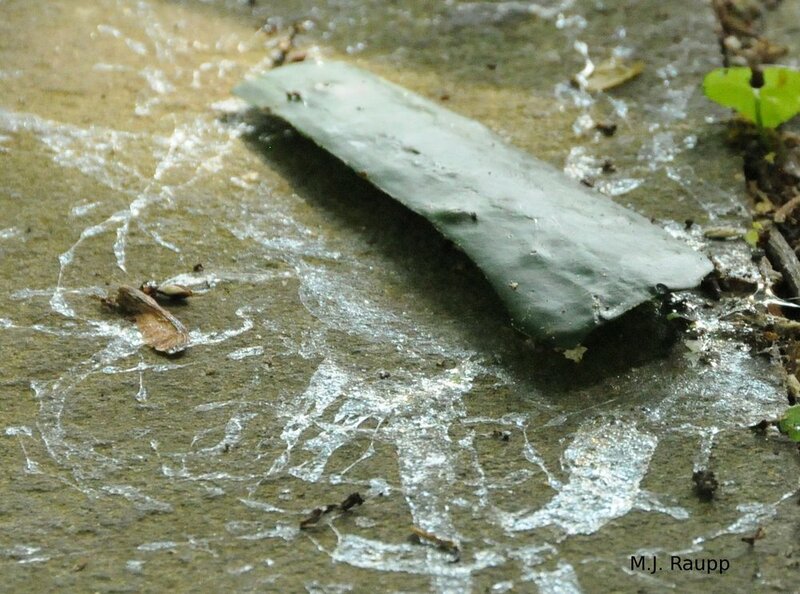 A fallen slice of cucumber is surrounded by slug trails in the morning. This brings us to what to do with slugs that are eating your gardens to nubbins. Slug baits containing poison can be purchased and sprinkled or placed around your garden to eliminate these ravenous mollusks. Diatomaceous earth or other abrasive products placed around plants may deter slugs from attempting to feed. Slugs need moisture to survive and reducing irrigation and saturated mulch may limit slug populations. Slugs are attracted to fermenting products, and yes, the yeasty odor of beer can be used to lure slugs to an inebriated death in a beer trap. One old timer shared his method of placing a roofing slate on the shady edge of a flower garden and leaving it undisturbed for several days. As slugs sought daytime refuge beneath the cool moist slate, he would simply lift the slate, scrape them off, and annihilate them. My personal slug program is a bit more direct. On my way to work each morning, I greet the slugs as they return from their nocturnal debauchery of my flower bed and head for their redoubt beneath my stoop. With a small stick, I divide their bodies in two and set their remains aside as a feast for the ants and other beneficial bugs in my garden. In the evening, I sit on my front stoop, sometimes with a yeasty beverage, and repeat the process of recycling slugs to the decomposition phase of my garden’s food web. As clever as they are, slugs seem to have no solution to my intervention and apparently lack resistance to this straightforward management approach. Two interesting articles were used in preparation of this episode, “An analysis of associative learning in a terrestrial mollusc” by C. Sahley, J. Rudy and A. Gelperin and “Analysis of associative learning in the terrestrial mollusc Limax maximus. II. Appetitive learning” by C. Sahley, K. Martin, and A. Gelperin.